Focusing on profit without accurate data makes it difficult to report your margins and take the proper corrective actions accurately. T/A Truck Stop was facing this challenge. 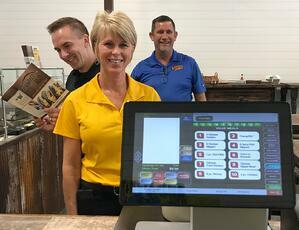 They had been calculating their profit margins in the back-end without a dedicated foodservice point-of-sales system. This made calculating accurate profit margins difficult without transparency into waste and product categories. As a solution, they adopted our order management system, providing direct vision into their inventory. Once they installed the PFSbrands point-of-sales system, T/A Truck Stop was now tracking how much Champs Chicken was being sold and the system provided an analysis of waste to calculate a true cost of their foodservice programs. With this data, T/A Truck Stop saw that their actual margin was sitting around 38-40%, instead of where they wanted to be and thought they were, which was about 50%. They worked with their business advisor to create a plan of corrective actions to increase their profits. They were able to take steps, such as increasing the frequency of ordering in smaller amounts and cooking less food more often to help reduce waste. For the first six months, the profit margins steadily increased to their goal of 48-52%, and they have been maintaining those numbers for the last six months. Now, everything goes back to the technology platform. With it, T/A is able to dig into any new problems that arise and create solutions on their own or with their business advisor. Each month they can see what is causing their profits to increase or decrease, and find out why. Maybe too much product was ordered by accident, perhaps foot traffic is up, or the seasonal items are moving quickly. T/A uses the order management system to inform decisions on any promotional items and come up with strategies to increase sales. With it, they never overlap promotions on their best sellers and instead focus on promoting foods that will improve their sales and reduce or maintain their costs. T/A has been able to benefit from the technology they’ve implemented over the last 12-months. They set out to increase the profitability of their foodservice program and were able to meet their goal and keep it steady for 6-months and counting. We partner with each of our vendors and offer technological solutions for companies like T/A to help them stay informed and make the correct strategic decisions to grow their profitability and their business. Copyright © 2018 Pro Food Systems, Inc.